Today, two decades later, Steve Lobel is a thriving businessman and philanthropist. Failing My Way to Success: Life Lessons of an Entrepreneur tells how the author turned defeat to his advantage and ultimate triumph. Over the course of dashed dreams, faulty judgment, and headstrong pride, failure becomes Lobel’s most effective teacher. Equal parts memoir and guidebook, Failing My Way to Success is full of practical lessons and inspirational advice for the business student, young entrepreneur, mid-career seeker, and anyone confronting defeat on the way to prosperity, stability, and peace of mind. "Failing my Way to Success is a searingly honest account of an individual’s willingness to risk everything to achieve his dreams. In this revealing and beautifully written narrative, Steve Lobel offers a powerful message of persistence and courage, of caring and giving back, one which will benefit us all." 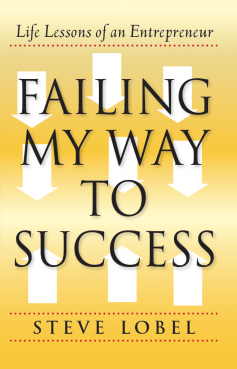 "Careening from triumph to disaster and back again, Steve Lobel’s Failing My Way toSuccess is a beautiful, eloquent reflection of its author’s honesty, wisdom, and deep humanity. The life and business lessons he shares are invaluable for all readers, regardless of whether we consider ourselves successes, failures, or somewhere in between." Steve Lobel is Vice President of Anchor Agency, where he established a division to provide insurance services for emerging-technology firms. An active community advocate, Steve has served as a board member and chair of numerous regional not-for-profits in human services and the arts. Failing My Way to Success is his first book.